Why are Bitcoin ATMs showing up in odd spots across the country? 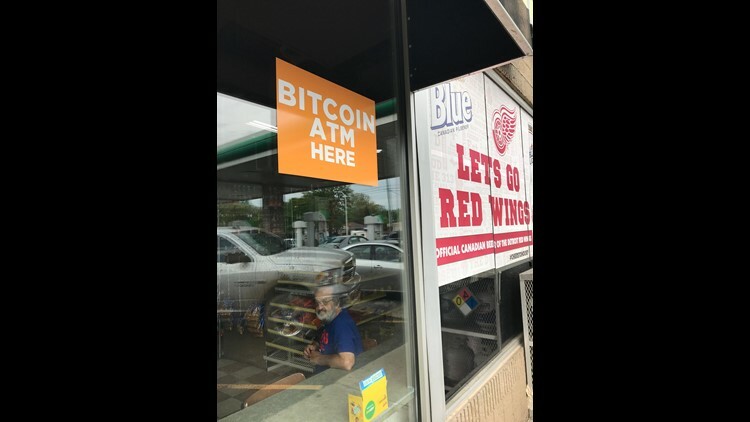 DETROIT — Walk into the Shell gas station on the corner of Nine Mile and Greenfield roads in Oak Park, Michigan, head toward the back of store, and there, next to the Better Made potato chips selling for $1, sits an ATM selling bitcoin. “The fastest and most secure way to turn your bitcoin to cash and your cash into bitcoin,” reads the screen for the Slon BTM. Nothing is all that secure about bitcoin, a cryptocurrency that had one incredible boom in 2017 and what's looking like one lingering bust in 2018. Bitcoin's price traded as high as nearly $20,000 in late 2017 — up from just $1,000 in early that year. But it's down nearly 70 percent in the past six months. Bitcoin's price was around $7,700 in trading June 5. And it was down to around $6,154 by June 22. Bits of bad news keep piling up. A financial regulator in Japan in late June ordered cryptocurrency exchanges to stop creating new accounts while improvements are made to stop money laundering and terrorist financing. So why, exactly, would anyone want to get in on the bitcoin frenzy at a local gas station? The Bitcoin ATMs in metro Detroit often show up in the oddest spots, including party stores, many in the neighborhoods where most people aren’t flush with cash. In mid-June, there were 80 Bitcoin ATMs in metro Detroit and about a dozen elsewhere throughout the state, according to Coin ATM Radar. There were an estimated 2,032 Bitcoin ATMs in the United States. More frequently, Bitcoin ATMs only sell bitcoin and won't buy it back. But there are more ATMs popping up that handle both transactions. Theoretically, one bitcoin should be able to cover fill-ups at the gas station for dozens of SUVs and all the chips and pop you want. But gas stations and party stores aren't accepting bitcoin as payment — just stocking up on ATMs that sell the cryptocurrency. Nationwide, Bitcoin ATMs are cropping up in communities like Union Gap, Washington; Fresno, California; Chicago; Washington, D.C.; Charlotte, North Carolina; Indianapolis; Louisville, Kentucky, and New York City. Bitcoin of America announced in May that it was expanding in five major cities and opening bitcoin teller machines in Cleveland, Los Angeles, New Orleans, Philadelphia, and Washington, D.C. It already operates eight Bitcoin ATMs in Detroit . 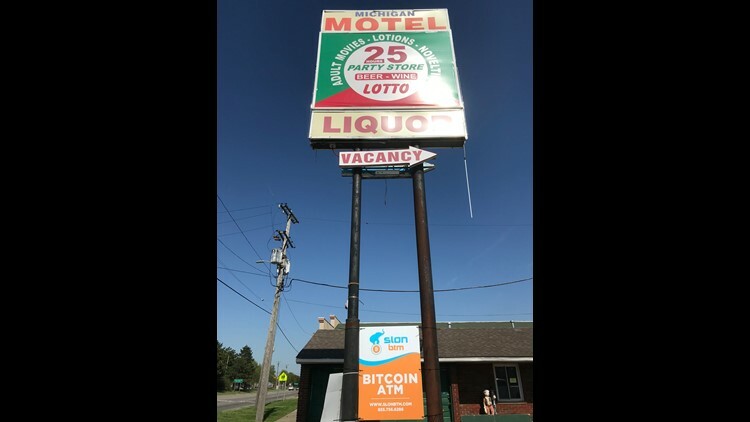 Sign advertises the Bitcoin ATM in the "25 Hour Liquor" store in Inkster. Andy Attisha, the owner of the Shell station in Oak Park, Michigan said the Bitcoin ATM at local stores offers a financial convenience for some people. Attisha said he’s paid a rental fee to have the Bitcoin ATMs — run by Slon BTM — at his stores in Oak Park and an Exxon station in Wixom. Slon BTM says it has the largest Bitcoin ATM network in Michigan, with more than 32 terminals across lower Michigan. Some people bring in a wad of cash to put into the Bitcoin ATMs, Attisha says, speculating they may be using it as a place to store their money — and later withdraw it when they need to pay bills. The official reason given by some industry leaders for placing Bitcoin ATMs in struggling neighborhoods is that the ATMs target those without bank accounts. Low-income households are the most likely to manage their money by using financial services outside of the traditional banking system — turning to check cashing stores and payday lenders. Some are shut out of traditional banking services after a string of bounced checks and other troubles. The ability to buy bitcoin via a digital wallet is a way to convert cash into a digital account. Michael S. Barr, the dean of the Gerald R. Ford School of Public Policy at the University of Michigan in Ann Arbor, questions the validity of claims that bitcoin ATMs can help the unbanked. Barr, who has written extensively on the challenges faced by low-income households lacking bank accounts, notes that bitcoin rises and falls dramatically in value quickly many times throughout a day or given week. What happens if you take $500 in cash and buy bitcoin and the value drops to $300 in the next week? Gas stations, like this BP station in Harper Woods, have indoor ATM-like stands where consumers can use cash to buy Bitcoin. A Bitcoin ATM at the Conant-Caniff Market in Hamtramck — a town ranked by one survey as the poorest in Michigan with a median household income of $23,609 — stands next to “The Lucky Spot” Michigan lottery ticket machine, not far from the hookah pipes and the rack for air freshener tags. My initial bet: We're looking at a quick way to spin the virtual coin machine here in the hopes of getting rich quick. "People may be viewing bitcoin as a lottery ticket in and of itself," said John Sedunov, assistant professor of finance for Villanova University in Pennsylvania. "It does seem that they are starting to pop up more and more in lower income areas." People in difficult economic situations may view the purchase of bitcoin as a chance to make money and capture some dramatic gains. But the incredible fall in recent months indicates clearly that bitcoin's rise is far from guaranteed. Consumers typically aren't spending $7,000 or $8,000 or more upfront on one bitcoin. The industry's average transaction at Bitcoin ATMs is around $200 or $300. Bitcoin of America says its typical purchase is $100 at the ATMs — and claims volume is growing even in light of the fall in bitcoin's price. Alice Gorodetsky, director for business development for Chicago-based Bitcoin of America, said people are using the Bitcoin ATM to invest, transfer money to others and because they want "complete control of their money (no middleman)." "By and large, the majority of folks buying cryptocurrency are speculating," Ciccolo said. Customers pay a fee of around 7 percent or 8 percent to buy the bitcoin at the ATMs, though the fee can be double digits in some areas. The fees can reflect the competition in the area. "From my perspective, much like a traditional ATM, consumers are willing to pay the higher fee for the convenience of the transaction," Ciccolo said. Ciccolo, who has a background in regulatory compliance, said Bitcoin clientele at ATMs tends to be young, male and willing to take risks. The ATM network has proven to be advantageous, offering lower barriers for regulatory compliance in some states, including Michigan. Many find it easier to set up a bitcoin ATM operation than selling bitcoin online, Ciccolo said. "You have a state that is very much open to bitcoin," Ciccolo said. In Michigan, for example, a money transmission license is not required to operate Bitcoin ATMs if the financial transaction doesn't involve a third party. But an administrator or exchanger that is a money transmitter should be registered as a money services business. Barr said he was unaware that Bitcoin ATMs were popping up throughout metro Detroit. When he went online, he said it was “pretty stunning” to see where some of the ATMs were located. After all, most landlords and utility companies aren't accepting bitcoin to pay the bills. Most business owners and companies will not accept bitcoin now for payment precisely because of the volatility. If they accept $35 in bitcoin for a tank of gas, what happens when the value drops to $15 or $20? “It’s a way of people taking advantage of the hype around bitcoin to get people to invest in something that doesn’t make a lot of sense for them,” Barr said. “Bitcoin and other currencies as an investment is exceedingly unwise,” Barr said. Barr and others warn that Bitcoin is a lot like speculative mania — similar to other hot investments that burned investors in the past. Is 2018 the start of that downturn? More frequently, we're hearing allegations about virtual currency manipulation. The U.S. Justice Department has reportedly opened a criminal investigation into potential price manipulation of bitcoin — which might include flooding the market with fake orders to drive up the price, according to a report by Bloomberg. The outstanding price increase in 2017 is being heavily studied to see if there was any fraudulent activity to drive up those prices. The North American Securities Administrators Association — a group of state securities regulators who work to protect investors — said that 70 investigations have opened up relating to initial coin offerings and cryptocurrency programs. There are 35 pending and completed enforcement actions nationwide since the beginning of May. Millennials are viewed as potential targets, as are consumers who are embracing products related to financial technology, or commonly known as FinTech. The unique, anonymous nature of cryptocurrency — a currency without a country — has raised concerns about the potential for fraud and abuse, too. Easy access to Bitcoin ATMs could increase the amount of bitcoin-related scams. Some con artists, for example, even have requested that consumers send bitcoins via an ATM as part of phony car sales or fake job opportunities. A Bitcoin ATM at one gas station, for example, shows a warning on the screen to those attempting to buy bitcoins. "Do not send bitcoin to anyone you do not know for eBay or to buy a car. It is more than likely a scam," the screen on the ATM reads. While many transactions can be legitimate, Beer said, there are concerns about drug dealers and others who might deliberately structure buying and selling bitcoin to conceal money earned through illegal transactions by using Bitcoin ATMs. But Ciccolo maintains that it's a myth to say it's impossible to track transactions. Ciccolo said Bitcoin ATMs are considered "money transmitters" by the Financial Crimes Enforcement Network, a bureau of the U.S. Department of Treasury, for regulatory purposes. Ciccolo noted that the software that comes with the ATMs enables operators to obtain customer information, including a scan of the customer driver's license. The ATM also is able to enforce transaction controls such as daily limits per person and caps on transaction denominations. The transaction records maintained by the ATMs' software help check for suspicious activity, such as one customer having several different phone numbers or attempts to get around regulators by "structuring" transactions within certain limits, Ciccolo added. The Financial Crimes Enforcement Network requires cryptocurrency entrepreneurs to have anti-money laundering programs in place. It is up to operators to develop and implement policies to report suspicious activity. Some remain skeptical that some Bitcoin ATM operators will be aggressively reporting money laundering activity. "Are they truly regulating the industry? Or are they just paying lip service to it? " asked Douglas Richards, a white collar defense lawyer at Denver-based Richards Carrington. The installation of cryptocurrency ATMs in low-income and high-crime neighborhoods, he said, is similar to the strategy used by companies that sold so-called "burner phones" in the same neighborhoods, knowing such phones were popular with drug dealers, and quickly replaced, to avoid being tracked by law enforcement. Others have questioned why many Bitcoin ATMs would be located in lower-income neighborhoods and some higher-crime areas. A lot about the Bitcoin ATM scene doesn't make sense. 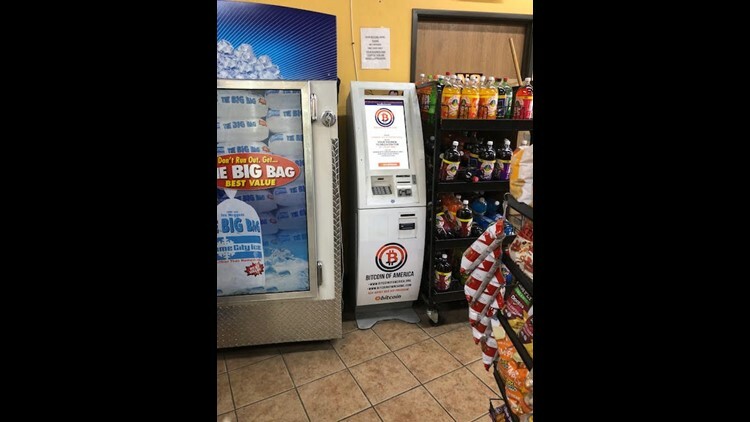 A Bitcoin ATM — run by Slon BTM — sits near a Subway counter and some shelves of wine at the store connected to the BP gas station at Vernier and Harper in Harper Woods, Michigan. Pick up a meatball marinara sub — and buy some bitcoin? A clerk at the Subway says the traffic is fairly steady some days for the bitcoin, particularly among younger buyers. Not surprisingly, traffic at the Bitcoin ATM at the Shell and Exxon stations in Oak Park and Wixom was riding high late last year. Now, there’s traffic but not as much since bitcoin’s value fallen so much, according to Attisha. Attisha, 25, said he invested about $4,200 in some bitcoin last summer. He stayed with it but had to get out of bitcoin in a few months because the wild rides were too upsetting. He declined to say how much money he made on the investment but he said he did make a profit.